Yes, I wanted to know why horses who can't even break 2:29.00 for 1 1/2 anywhere else, go over and run in the Japan Cup and run in the 2:22's! What the heck is the deal? I sure wish Secretariat would have had the chance to run in Japan! Thank you. 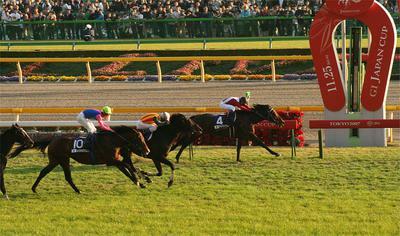 Answer: Horse racing in Japan is a huge industry and the quality of the horse racing there is very high. Japan bred horses have won well over 30 Group 1 races worldwide over the past 17 years, including France, Australia, Hong Kong and Dubai. The invitational Japan Cup run on turf over 2400m (just over 1 1/2 miles) attracts the fastest horses in the world. Combine that with a fast turf surface on an easy track and it is little surprise that times are on the fast side. Comments for Why are times at the Japan Cup so fast? Yes, thank you for your response. I just have one thing to add. I guess you made a mistake, 2400 meters is actually less than 1 1/2 miles by about 46 feet. Thank you.